This wish list is mostly for Emma's benefit, as she always asks me what I want for Christmas/birthdays and then ends up buying something off my blog. A smart one she is, that sister of mine. Here's what I came up with based on my laptop's open browser tabs. (Speaking of which, Tiho wants to design me a t-shirt displaying my personal catchphrase: "Don't close my tabs!" (No, but seriously, never ever close my tabs). ONE: My favorite perfume. I've been out for over six months and haven't gotten around to reordering. TWO: The Hat Book. A collection of images by one of my all-time favorite photographers. THREE: A yellow coffee/tea pot. Because it's super duper cute. FOUR: Leather Stud Wallet. Simple, classic, stylish, & well-made. (I'd use this for years). FIVE: Vintage Kaj Franck Heart Bowl. Dream collector's item (aka, always on my ultimate wish list). SIX: Original Lulie Wallace Art Print. This would be a lovely addition to my collection. 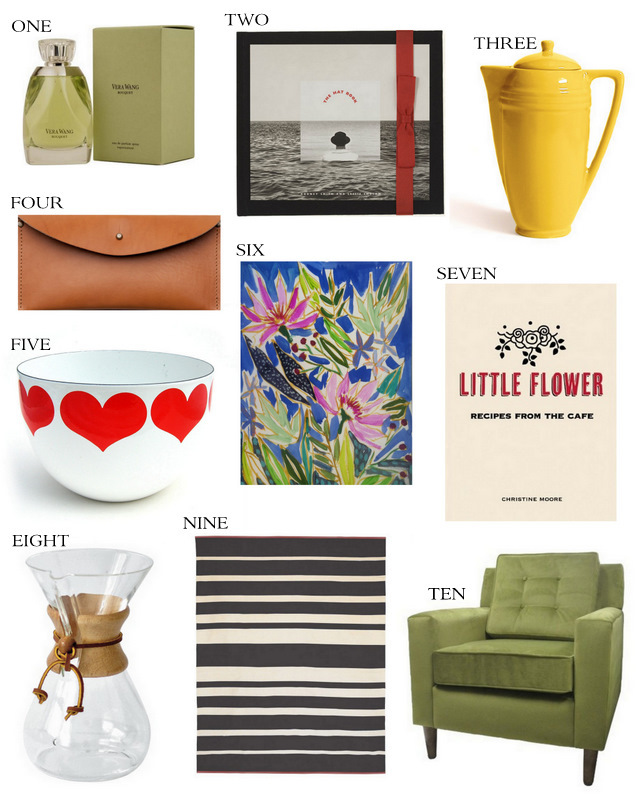 SEVEN: Little Flower Cookbook. I love the name. And the recipes sound delicious. EIGHT: Chemex 6-Cup Glass Coffee Maker. How is it possible I don't already own this? NINE: Gradiated Striped Rug, size 9x12. Unbeatable price for the quality & size. TEN: Clybourn Loft Chair. Two words: green velvet. John has closed my tabs enough times to know that only unhappiness will befall him if he does. I kid you not, my childhood couch is green velvet. My mom still has it, but it is covered, now, because the velvet has worn thin in patches.